The greatest of the Great Lakes is Lake Superior, the northernmost and westernmost Great Lake — and the biggest, the deepest, the coldest and the most pristine. Its name comes from early French explorers who labeled it “le lac superieur,” meaning “the uppermost lake.” According to Native American Objibway lore, it is protected by Nanabijou, Spirit of the Deep Sea Water. 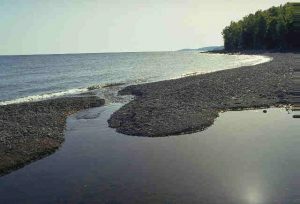 Roughly the same shape and slightly larger than South Carolina, Lake Superior has a surface area of more than 31,000 square miles — the largest of any freshwater lake in the world. Only Siberia’s Lake Baykal, because it is deeper, holds more water. Bordered on the north by Ontario, on the west by Minnesota and on the south by Wisconsin and Michigan, Superior at its greatest measures 350 miles long and 160 miles across. The lake’s surface is about 600 feet above sea level, with an average depth of 490 feet and a maximum depth of 1,333 feet. Its clear, frigid waters are bordered by 2,980 miles of shoreline, 90 percent of which is forested, much of it still wilderness. Superior’s flushing time — the time it takes for all the water now in the lake to be replaced by new water — is 191 years, the longest of any of the Great Lakes. This also makes Superior the most vulnerable to long-term water pollution: if the lake were to become polluted today, and all pollution stopped tomorrow, it would take almost 200 years before its water would again be as pure as it was yesterday. 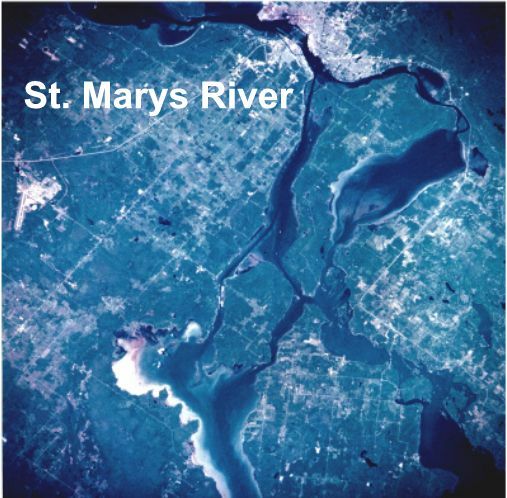 At Superior’s southeastern corner, its sparkling waters flow into the St. Marys River, a crooked 61-mile channel of water separating Michigan’s Upper Peninsula from Ontario. Just 16 miles from the mouth of the river and Lake Huron are the St. Marys Rapids, where the river drops about 20 feet in half a mile. For centuries, these rapids were a barrier to water travel between Lake Superior and the other lakes. It wasn’t until 1855 that the first locks and canal for moving ships around these rapids was built at the international twin cities of Sault Ste. 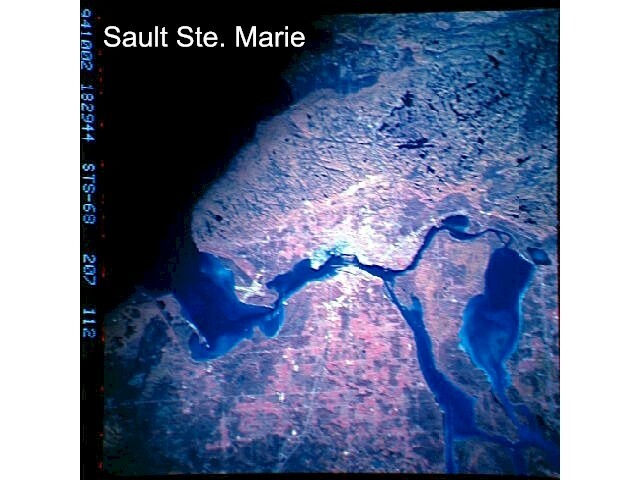 Marie located in Ontario and Michigan. Today there are five locks — four operated by the U.S. and one by Canada — including the giant Poe Lock, the largest on the Great Lakes, which can hold ships up to 1,100 feet long and 105 feet wide. In peak years, more tons of cargo passes through these locks than any other on Earth.